* If you intend to enrol for 2 or more courses in the same term, please register all courses at the same time online to enjoy the percentage discount of total course fee at the point of registration. Once your first class is enrolled/paid, the online system calculates percentage discount based on the 2nd course fee only. If you have already registered for your first class, please email or register in person at SLAP Dance Studio. 2. Click on ‘Register’ to get started. OR ‘Sign in’. 3. First, check if you are already setup. Click on ‘Find Me’. If system finds you, click on your name to start. If you are a new user, enter a random letter and click ‘Find Me’. Then click on ‘I searched and still don’t see my name’. 4. Upon successful registration, you will be redirected to login page to sign in. Signed up at the SLAP Dance Studio in person? 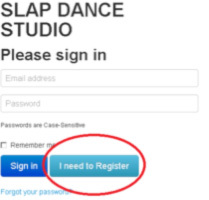 If you signed up at SLAP Dance Studio in person, our staff will guide you through the online account registration at reception. 1. First, click on ‘My Students’. Then ‘Add a Student’ (i.e. yourself) to your account. 2. Once student is added, you can start enrolling for classes* by clicking on ‘Register for Classes’. * If you intend to enrol for 2 or more courses in the same term, please register all courses at the same time online to enjoy the percentage discount of total course fee at the point of registration. Once your first class is enrolled/paid, the online system calculates percentage discount based on the 2nd course fee only. 3. Once your registration/payment is complete, SLAP Dance Studio will verify details, and email you within 3 working days. If you made a mistake in online registration, don’t worry ☺. Drop us a note at hello@slap.sg. 1. Go to ‘My Students’ to view your list of current and upcoming classes. 1. Click “My Students” – You can see your registered classes. 2. Click “Pay Tuition” once you’ve verified that your classes are correct. 3. Click “Set Payment Amount” once you’ve verified the amount. After this, you will see PayPal button at the bottom. 4. Please make payment through Paypal. Once payment is complete, you will receive an email to confirm payment. 1. Go to ‘My Account’ to view transaction and payment records. 1. Go to ‘My Account’ to update account details & password.